The Alpine village of Berchtesgaden got its start in 1102AD when Count Heinrich II of the Knights of Comburg built a small church in the heart of today’s Old Town. The count’s daughter would marry Conrad III (House Hohenstaufen) who later became the King of Germany, and while he was based in Rothenburg it helped Berchtesgaden grow. By the end of the century, the chapel was expanded into a full cathedral complex and monastery for Augustiner Monks. Salt Mining was also established in 1194 (current mine from 1517) which brought wealth along with it. Through the Middle Ages, the beauty of Berchtesgaden wealth from its salt trade helped the village grow and it eventually joined Bavaria in 1810. This free Berchtesgaden walking tour map centers around Market Square where you can see evidence of the Medieval commercial power of Berchtesgaden. It is such a beautiful village that it is no wonder the Bavarian Royal Family was attracted to build a residence in Berchtesgaden and the area was later frequented by Nazi leaders. Today Old Town Berchtesgaden is still packed full of great sights to fill up an enjoyable half day do it yourself stroll with our easy to follow walking tour map. About Market Square: The centrally located Market Square has been the center of commerce and social events in Berchtesgaden since village’s founding in 1102. While Berchtesgaden got rich early on from the salt trade, Old Town saw a boom starting in the 1500s when it was upgraded to a Prince-Provostry union by the Holy Roman Empire. In 1558 the Market Square Fountain (Marktplatz Brunnen) was erected in the middle of the square and quickly turned into a popular gathering point. A marble basin and lion statue, which is the symbol of the Wittelsbach family, were added to the fountain in 1677. The beautiful fountain was renovated in 1860 by donations from King Ludwig I in honor of the 50th anniversary of Berchtesgaden officially joining Bavaria. The most striking feature of Market Square is the iconic tower of the Deer House (Hirschenhaus). The lodge-style building was originally built by merchant and publisher Georg Labermair in 1594. We love the murals on the facade showing Maximilian Henry of Bavaria upgraded Market Square Fountain in 1677 and Georg Labermair who built the Deer House. Later on this Berchtesgaden walking tour map, you’ll see even better murals on the back of the Deer House building. Make sure not to miss the Market Square’s large Neuhaus Restaurant (website) which is a beer hall that was built in 1576 by Prince Provost James II. Every Friday from 8am-Noon there is a large local Farmers Market set up in the square because you can’t be called Market Square without a market! The local stalls sell numerous culinary delights, regional, farm products, fresh fruit and vegetables, smoked fish products and crafts. On Monday nights from June through September, the square has traditional Oompah band concerts at 6pm. Some of the most significant festivals of the year also take place in the square including Marketfest (website) the first Saturday of August, Oktoberfest in late September, and the Advent Christmas Town (website) in December. Any of these festivals are amazing, but the celebrations around Christmas are the most magical as the area around Market Square through Royal Palace Square is turned into a storybook wonderland. About Market Street: In this narrow, pedestrian-only shopping area flowing from Market Square you won’t find chain stores, it is local authentic shops only. As you wander the lane, stop by one of our favorite businesses called Franz Stangassinger Lederhosen (website) which specializes in hand-making traditional Bavarian outfits. Another great venue is Bier Adam (website) which is the oldest beer hall in town dating back to 1546. At the end of the street is the unique Well Ducats Fountain which has a donkey who is spitting and peeing water at the same time. We love that this area also has free wifi especially since phone coverage for international visitors can be spotty in the mountains. About Brine Line Cliff Walk: Clinging to the cliff side on Calves Hill (Kälberstein) is a wooden walkway called the Brine Line Cliff Walk (Soleleitungssteg) which has been offering the best views of Old Town. The Brine Line opened in 1816 to send partially processed Salt rock in a soupy brine form factor 29km away in Bad Reichenhall for further processing. Salt mining has been important to Berchtesgaden since 1193 with the current mine from 1517. Through medieval times the salt trade helped an independent Berchtesgaden keep pace its neighbors like Hallein, but when salt refinement took off in Bad Reichenhall in the 1700s the town really boomed. The development of Bad Reichenhall by the Bavarians even helped Berchtesgaden become more comfortable with joining Bavaria in 1810 which ultimately lead to the brine pipeline. Today there is an excellent walkway called the Emmaus Way (Emmaus-Weg) which follows the first 5km of the Brine Line Path between the Berchtesgaden Salt Mine and the village of Ramsau to the west. The in-town part of the route is a popular evening stroll for locals and you need to check it out at least for a quick peek just for the amazing views. As the sun goes town they light 75 oversized lanterns on this in town wooden plank stretch making the atmosphere even more wonderful. While walking above Berchtesgaden, you can visit a great castle-like home and a Free Manson Temple with the Seeing Eye emblem looking down on the village. About Christmas Shooters Square: The wide open Christmas Shooters Square is named after the local Christmas Guard, also known as the Christmas Shooters. Since Medieval times the shooters have rung in Christmas by lining up in traditional clothing and firing their black powder guns (Handböller) with a series of booms into the sky. There are 17 regional clubs with over 1,000 active members that still carry on the tradition today. For more info, see our page on the best festivals in Berchtesgaden. As you circle the square, it is highlighted by the muraled Dollinger Tracht store and the castle-like Cafe Forester (website). The cafe, which opened in 1873, has some really good food, especially their desserts and tortes. Next to the cafe is the huge Hotel Edelweiss (website) which has luxury room and roof-top dining. The small park in front of the hotel is also where Berchtesgaden’s May Pole is raised each Spring. About The Monkey Facade & Bucket Fountain: The best murals in Berchtesgaden is on the back side of the Deer House called the Monkey Facade. 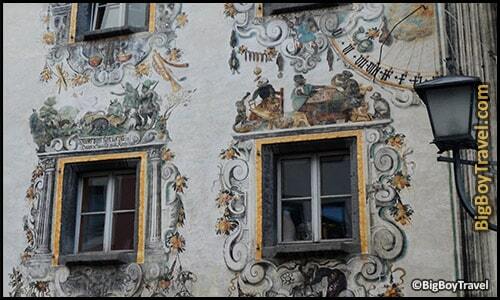 The mural was painted in 1610 and is considered the oldest Lüftlmalere mural in Bavaria. Unlike other murals from the area, this style shows aspects of every day like instead of religious scenes. It’s said that when the client refused to finish paying for the commisioned work the artist turned the human faces into monkeys as payback. Sitting below the huge mural is the Mother & Child Fountain (Mutter-Kind-Brunnen) which shows a mother pouring a bucket of water out with her son while a jumping fish at the other end spits water. The Bucket Fountain was originally built in the 1980s and was moved to its current location in 2012. About Royal Palace & Collegiate Church: The roots and settlement of Berchtesgaden truly begin at the grounds of the Royal Palace. The first sections of the Collegiate Church of Saint Peter and Saint Paul were built in 1102, which is 54 years before they even started mining salt here. The complex was expanded in 1180 with a monastery for the Augustiner Monks and an inner Romanesque Cloister which still survive in part today. When touring the grounds the cloister leads to a Gothic Hall from the 1300s with a ton of sculptures dating back to the 1500s and 1600s. The Bavarian Royal Family started using the complex in 1810, but it was in 1923 that it got a huge facelift when Crown Prince Rupprecht of Bavaria turned the grounds into a regular residence for his family. With his love for hunting the Prince not only set up multiple rooms filled with huge hunting trophies and Deer Museum, but also set up rooms of opulence filled with tapestries and porcelain. While it is a shell of its former self, the palace still has interesting exhibits and small rose garden. A 50-minute guided tour takes you through 30 of the Palace’s 214 rooms. In addition to the Crown Prince Rupprecht’s Deer Museum, you’ll see the Medival Court Kitchen, Gothic Hallways, the Armory, the private rooms of Duke Franz of Bavaria, and the large outdoor rose garden which is stunning. Even if you don’t time to tour the Palace you should still walk through the vast Royal Palace Square (Schlossplatz) which is free to visit. With the huge space and church backdrop, it’s no wonder that the Palace Square is the center of the Advent Christmas Town Celebration (website) in December. 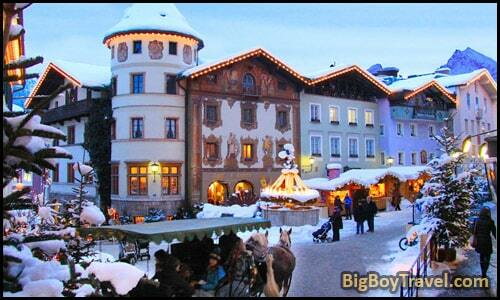 Almost every inch of the Square gets filled with merchant stalls, nativity scenes, and Christmas cheer. Palace Hours: Courtyard is always open, the interior of the Palace is only available by guided tour. Often closed for 2 weeks in August with the Wittelsbach family visits. Guided Tours: Last 50 minutes and covers 30 of the 214 rooms. May 16th-October 15th Sunday-Friday 10am-1pm & 2-5pm; closed Saturdays. October 16th-May 15th Monday-Friday 11am & 2pm; closed Saturdays & Sundays. Tour Cost: Adults 9.50€, Kids 4€. Combo tickets available to include the Adelsheim Museum. Special themed Advent Tour at 4pm on Sundays over the holidays is 12€. Website: here. About The Wine Field Chapel: Officially called the Chapel of the Beatitudes, this tiny house of worship on the hilly slope (Ponnzenzenbichl) of Berchtesgaden offers an awesome countryside vantage point for taking photos of Watzmann Mountain. The path to get here is open all year and the chapel is especially beautiful during the evenings around Christmas when it is lit up in gorgeous lighting. The nearby field is usually filled with yellow flowers in the Spring through Summer which gives you a chance to have a Sound of Music moment while surrounded by mountain peaks. About Cafe Lockstein: As you wind down the North side of the hill housing Cafe Lockstein, Lockstein Street with gradually bring you back down into the village. The views of Berchtesgaden with Watzmann Mountain looming tall in the background from Lockstein Street are simply amazing. If there ever was a classic vantage point in the city this is it as is have been the inspiration for many painters and artists throughout the years. Website: Here. About Lockstein Street: As you wind down the North side of the hill housing Cafe Lockstein, Lockstein Street with gradually bring you back down into the village. The views of Berchtesgaden with Watzmann Mountain looming tall in the background from Lockstein Street are simply amazing. If there ever was a classic vantage point in the city this is it as is have been the inspiration for many painters and artists throughout the years. About Adelsheim Mansion Handcraft Museum: The pink Renaissance Mansion Adelsheim was built in 1614, and is a great location for the Berchtesgaden Handcraft Museum. Started in 1897, the museum was moved into the mansion in 1986. The museum’s exhibitions show typical local crafts such as wood carvings, marble ball grinder, and wooden boxes, but also historical costumes and furniture, as well as numerous testimonies of Berchtesgaden history. Additionally, a sales exhibition in the House the opportunity to purchase authentic native art Berchtesgaden. Hours: Tuesday-Sunday 10am-4pm; Closed Mondays. Cost: 2.50€; Combo tickets available to include the Royal Palace. Website: Here. About The Salt Mine: While this historic salt mine was opened all the way back in 1517, salt mining has been going on in Berchtesgaden since 1194! In the Middle Ages, this white gold helped Berchtesgaden rise to economic power along with other regional salt powerhouses Salzberg, Hallein, and Hallstatt. The guided tour will teach you a lot about salt mining, brings you to an underground lake, and the highlight of sliding down the old 120-foot-long wooden miner slides. All of this is of course done while wearing a miners jumpsuit and includes a salt train ride to help you get the full effect. One of the best things about the Berchtesgaden Salt Mine is that it is the only one in the region that stays open year round for tours. An additional secret that many people don’t know about is that there is a salt mine relaxation spa in another cave right next door. A visit focuses on silent meditation and relaxation for roughly 2 hours, and they also have options for an overnight stay in the Summer and Fall. Getting Here: You can take either Bus 837, 840, or 848 from the Berchtesgaden train station to the Salzbergwerk Stop. If you walk it from the train station, it takes about 20-25 minutes. Hours: May-October Daily 9am-5pm, tours leave every 10 minutes; November-April Daily 11am-3pm, tours leave every 25 minutes. Cost: Adults 14.90€, Children 9.50€, Family 41€, for the lift to the top add about 3€ per person Time: Tour lasts 1 hour, total time for tickets, tour, and changing into miner’s outfits is up to 2 hours. Ticket Tip: Buy online on their website to save yourself a wait in line, can cut your total time by at least 30-45 minutes during peak hours. Relaxation Spa Hours: May-October Daily 9:30am & 2 or 4pm; November-April Daily At 11am & 2pm. Spa Website: Here. About The Berchtesgaden Hofbräuhaus: The most fun dining and drinking experiences in both Germany & Austria happen at the local beer halls. Those of you familiar with Munich’s Hofbräuhaus will love Berchtesgaden’s Bräustüberl which dates back to 1645 and is now even part of the Hofbräuhaus chain. You’ll find it to be an authentic place to grab a 1-liter beer, eat great traditional Bavarian food, and join in rowdy sing-alongs to live music. On Friday evenings you can even watch the men’s thigh-slapping, heel-whacking, whip-snapping dances called Schuhplattler. Visiting the Bräustüberl Beer Hall is really a great experience with hunting lodge decor and you’ll want to take pictures of everything. Even if you forgot your lederhosen you can fit in like a local with a seat at the beer hall’s community style seating. During Trachtenfest each July the on-site blacksmith will challenge you to a warm beer chug. If you accept, he’ll stick a smoldering blacksmith rod into your beer until it begins to bubble after which you try to chug the entire liter. Warm beer is typically easier to chug and even if you can’t drink much at once the novelty is really worth it. No trip to Bavaria is complete without a stop at your local Hofbräuhaus. It is worth noting the current brewery in Berchtesgaden was only used for production and distribution until 1890 when it began serving beer in-house to customers which led to it being rebuilt for that purpose in 1906-1910. There are elements of the old brewery all around including original parts of the watermill across from the entrance which powered production. Make sure to visit the old Baker’s Mill (Pfistermühle) across the street from the beer hall whose wooden grinding wheel is still turned by the river. Getting Here: You can walk, but Bus 837 stops right out front on its way between the Salt Mine and the Train Station. Buses 848 and 840 also go between the Salt Mine the Train Station with a stop right by the Beer Hall. Website: here. About Luge Slide: Just a quick ride up the Obersalzburg Cable Car from Old Town, family fun awaits at the 2,000-foot-long metal slide (Sommerrodelbahn) which speeds you down the mountain. After whizzing down the hill, the track automatically shuttles your cart back up to the top for more fun. You’ll want to do ride the luge at least 2 or 3 times. The Maltan Family that runs the Luge also runs a beautiful hotel and beer garden nearby if you are looking for Berchtesgaden accommodations. In addition to a great elevated location, the hotel rooms are some of the best priced in town. As you approach the cable car lift to ride up to the luge, make sure to notice the former WW2 outpost where SS Guards once policed traffic up the hill to Obersalzburg. During World War 2 the Obersalzburg hillside was forcibly occupied by the Nazis and served as Hitler’s backup command center. His Berghof Mansion is where he spent the most time out of any location over the war. The complex grew to house many of his top generals, a vast underground bunker network, and the famous Eagles Nest retreat (which he barely visited). While many of the Nazi buildings were bombed, looted, and removed, the hilltop today has some ruins, an excellent museum, bunkers you can visit, and a bus up to the Eagles Nest. To learn more please follow our Hitler’s Eagles Nest Tour Guide. Getting To The Luge By Alpine Lift: There is a convenient Alpine lift that goes right from Berchtesgaden up to the Luge. Slide Hours: April through early-November 10am-6pm; Closed when wet; also closed in Winter. Ride Cost: 1 ride is 2.50€ for Adults or 2€ for kids. Discounts for multiple rides with 18€ for Adult rides 10 as an example. Combo Ticket: You can buy 3 rides plus round trip on the cable car up the mountain for 13€. Website: Here. Featured On: Hitler’s Eagles Nest Tour.